Hive 2015 recap & Learning Pop-Up! The end of 2015 is just around the corner, and again we’ve had a fantastic year of the Hive Learning Pop-Up since our launch in 2014. Here’s how 2015 went down! Since our launch in fall 2014, in partnership with our awesome community partner – the Vancouver Maker Foundation, we’ve managed to organize a series of smaller-scale, community-based, quarterly Maker Education Salon to sustain engagement and interest with the local Maker Education community. The #MakerEdBC community has definitely grown and expanded since the Hive Pop-Up kick off in 2014. 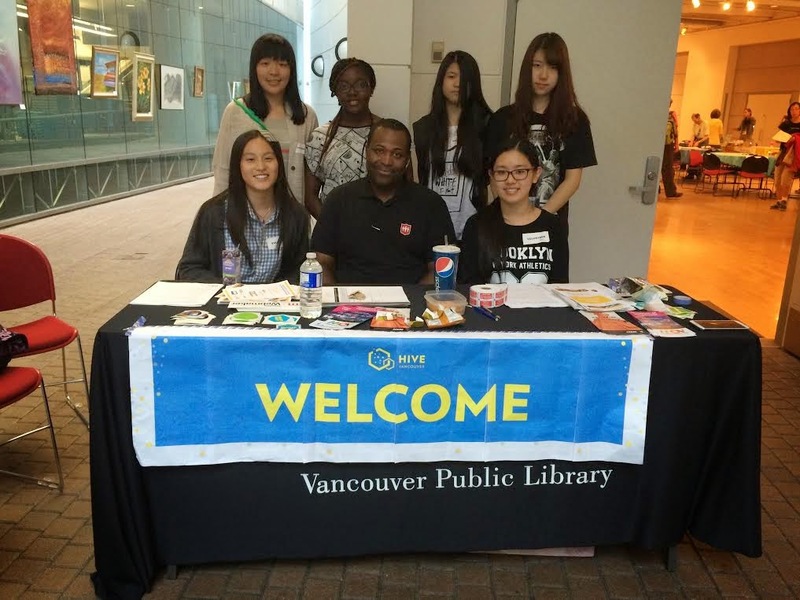 In Summer 2015, our wonderful community partner from the Vancouver Public Library approached us, asking for the Hive Vancouver team to put together another Hive Learning Pop-Up because of the success from 2014. Though we’re down 1 person with Kat pursuing her PhD in the UK, Dethe & I persisted and managed to rally up local Mozillians and volunteer contributors to put the event together. After a full year of community effort, I can proudly say that we’ve definitely surpassed ourselves from last year. To pat ourselves on the back, we’ve managed to double our number of community partners participating in Hive Learning Pop-Up, nailed the #MakerEdBC hashtag on Twitter, and gained traction by increasing interest from local communities. At the 2015 Mozfest, my 3rd MozFest, I was part of the Participation Leaders Cohort where I joined an army of other Mozillians who were volunteer contributors just like me, who chose to dedicate their valuable time to the Mozilla mission. I was ecstatic when I learned that I was chosen as part of this cohort because after a few years of being a volunteer contributor, I was growing a bit weary of battling the ongoing challenges of limited resources of a growing community. Based on the guidance provided by my awesome mentor Emma Irwin, I created this #MyMozFest Experience “Plan”. We didn’t have time to dive into the Prototype & Test stages, but considering the session was only 1 hour, I think we did a pretty good introduction of the Design Thinking Process. From this session, it made me think about how different, yet similar our communities are, which is relevant to Mozilla because we need to be familiar with the strengths & weaknesses in our communities in order to achieve success (whatever it may be) in our communities. What would you like to achieve in your community? For instance, it could be to achieve a healthy, sustainable & successful Mozillian community. If so, what does it look like for you? Identify the strengths & weaknesses in your community. Reframe the problem – think about what you’re really trying to achieve? Can things be done in a different way in order to achieve the same goal? Be brave. Try it out, prototype & test it. Does it work? Does it totally fail? What happens when you try it? This year I had the pleasure to attend Mozilla Festival 2014 at Ravensbourne College in London, UK. This is my second time attending MozFest. The first time I was representing Hive NYC helping out at the very first Hive Pop-Up at MozFest. This time around I have multiple roles – I’m a Mozilla Rep & I am representing Royal Roads University facilitating a session under the Build & Teach the Web Track. Attending #MakerParty which included participants of various ages! Last but not least, another major highlight was facilitating my session – Webmaking in Higher Education. The purpose of my session was to meet like-minded individuals who work in higher education and/or educators in various areas to talk about how we can incorporate webmaker tools and other open source tools in our learning environment. You can find the details of my session in this Session Notes Google Doc. Awesome Hive Vancouver team member Kat wrote this blog post wrapping up Hive Vancouver Learning Community’s launch event! Launching Hive Vancouver Learning Community. Chicago Mozilla Rep Robby blogs about participating in the very first Vancouver Hive Pop-Up! Robert’s Mozilla Stories Blog: Vancouver Hive Pop-Up. Robby at the Pop-Up Welcome table with our awesome youth volunteers! Check out this awesome blog post from Michaela, the newest North American Mozilla Rep talk about her experience helping out at our very first Hive Vancouver Pop-Up over the weekend. A Quick Recap of Vancouver | Caffeine and Star Stuff. Michaela showing Pop-Up youth participants how to remix with AppMaker. At this year’s Vancouver Mini Maker Faire in additional to having an awesome Mozilla Webmaker booth, Emma, Dethe & I decided to put together a Makers as Mentors workshop to encourage local makers to become mentors through Maker Parties! We also had many librarian friends joining us for the workshop including Tamarack, who took a snapshot of Emma delivering the workshop. Maker Faire this year was lots of fun! We made a lot of friends from last year’s Faire and made a few more friends again this year. This is definitely going to be an annual tradition for Mozilla Webmakers in BC. I was extremely honoured to present ‘Integrate Web Literacy with Mozilla Webmaker’ , at the Canadian Open Data this past February 20th, one day before Open Data Day. The Open Data community has been a collaborative partner of Mozilla in British Columbia for a couple of years now, and definitely kindred spirits in promoting openness and digital literacy. In 2013 our Mozilla community joined in for Open Data day at City Hall in Victoria BC. Herb Lainchbury organized the adult hackathon, and we brought a group of youth to hack on Webmaker tools with a focus on memories of their city. It was great event, made even better by the partnership of our two communities providing opportunity for youth to interact with adults making a difference in their community. As a developer I am very keen to learn more about opportunity to bring open innovation to advocacy projects, and although i’ve long understood the value of Open Data – this conference really opened my eyes to not only the potential, but the work being done across Canada to make a difference in everything from how we evaluate neighborhoods and Real Estate, to how we can better hold accountable – our political leaders. Also Vancouver BC in Minecraft.The Open Data community is one to watch for innovation. My suggestion is, that the future of open data advocacy depends on the next generation’s recognition that the web is theirs to make. Web Literacy is not a part of the curriculum in British Columbia (that still sounds crazy when I say it out loud), and so that invitation is entirely missing. Here’s the Open Data Day Hacktivity we created. I met lots of inspiring, cool people doing amazing things – and EXCITED EXCITED – about teaching the web, including Sean from the City of Surrey who will be running teen hackathon with Mozilla Appmaker as a result of standing up and asking for ‘help’ after my talk 🙂 Can’t wait to hear how that goes. “Think Globally, Act Locally” originally began at the grassroots level, however, it is now a global concept with high importance. It is not just volunteers who take the environment into consideration. It is corporations, government officials, education system, and local communities. 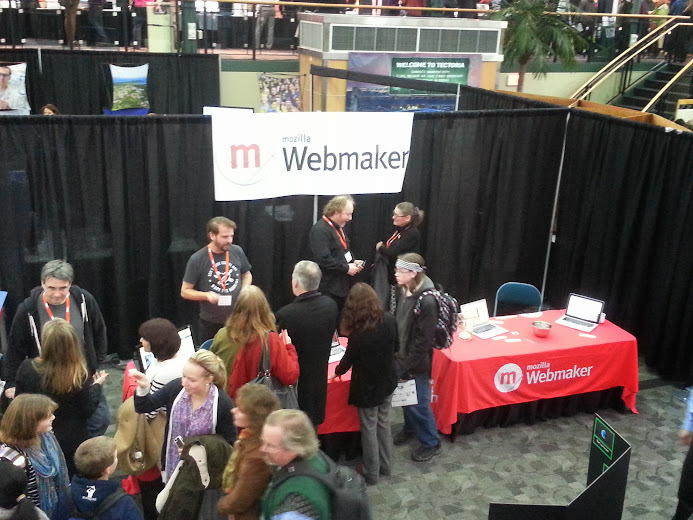 On Friday December 13th, our local Mozilla community hosted a Mozilla Webmaker booth at Discover Tectoria, a showcase of Victoria’s tech community. In addition to the booth, Dethe Elza and I presented two sessions: ‘Learning to Code with Mozilla Webmaker” to an auditorium filled with parents, youth and educators(which was a LOT of fun). Originally I envisioned a more general ‘Mozilla’ booth, but given our community work with Webmaker it just made sense. We spoke with a wide-range of educators, young people, parents, grandparents, technologists and students, and for each the connection between Webmaker and their own values was a quick match. The overwhelming consensus was that people wanted to participate, connect, learn more – and volunteer. Huge wins all around. Many were surprised to learn Mozilla had a local community. The message that Mozilla exists beyond a browser, as as a group of people in the community was so important to share. Being ‘on the ground’, and at events like one is an opportunity to personalize and localize the meaning of our work with the ‘invitation’ to join us. This visibility was a very big win, and alone made the conference worthwhile. Core community members: Clint Lalonde, Scot Leslie, Dethe Elza, Brenda Petays, Erika Drushka and myself were able to come together for a day – a huge deal for a group with other full time commitments and family. It was so, so, so, so great to spend time together. Of course two friends were missing: Helen Lee and Brett Gaylor – we missed you! We wrapped up each session with our local Webmaker Club webpage, a description of what I was doing in Sooke with my Webaker Club, encouraging others to consider something similar in their schools: again lots of interest. If ‘too much interest’ is a thing – I might have reached that with requests to talk to groups of teachers, and I have a bowl of business cards, and sticky notes with emails and phone numbers of those who want to act locally with Webmaker. I have to make some decisions on how best to follow-up with each of these individuals, students who want to teach coding, educators who have a lot of questions about how much they have to learn to teach coding, grandparents, parents, administrators, technologists – even an HTML5 video game programmer who seem 100% keen to teach. What I wish, have always wished is that Webmaker, or even just Mozilla had a community hub. I wish I could say ” Go to webmaker.org/victoria where you can create your own school group/post a question on the forum. I have the skills to build this for local purposes, but truly wish for something like Drupal.org for everyone who wants to grow and connect community without too many jars of sticky notes 🙂 In North America I feel this movement is about to ignite and that a community hub would help that tremendously. The entire weekend, I’ve had the the theme in my head ‘Think Global, Act Local‘, a phrase used to capture the spirit of acting locally with global impact on the environment. It’s a phrase I feel equally translates to our work with Mozilla. As a Mozilla Rep I feel very connected to the global community of Mozillians, but my original reasons for getting involved have always been to bring change locally; to inspire others to do the same where they live. I’m incredibly proud to be part of a community empowering change from the grassroots level on Vancouver Island. Mozilla BC – lots happening! This year Mozilla is a sponsor for Discover Tectoria – an all-ages showcase of the local tech scene in Victoria BC. Technology is Victoria’s #1 private industry, and we’re excited to have this opportunity to share our community work with Webmaker, privacy initiatives like Lightbeam and the future of mobile with Firefox OS. Aside from hosting a booth we’ll also be running a ‘Webmaker – Make the Web’ session as part of the education stream where Google Science fair winner (for her age group) Ann Makosinski will also be talking to kids. Should be tons of fun! To help support others who may want to run a similar club I’ve setup a Webmaker Club Website, with Github repo for resources. As the ‘donation’ section suggests, I am also looking for donations or sponsorship to help with tech purchases Right now I have 28 kids 2 laptops, and no time to fundraise – I’ll start by asking Santa for a few Raspberry Pi.